Microsoft has done a commendable job at delivering a truly modern operating system that is just as feature-rich as the competition. Windows Phone 8 takes all the strengths of Windows Phone 7.x and pushes them to the next level. Like Apple, Microsoft now has a broad ecosystem of platforms, devices, apps, and services that run across its product portfolio. It's a compelling selling point that can't be underestimated. On a feature-for-feature level, no one can tell you that Windows Phone 8 lacks anything. It has just as many tools available as competing platforms when it comes to communication, media, the cloud, and productivity. It surpasses even surpasses iOS and Android in some respects, such as gaming with WP8's tie-in with the XBox ecosystem. Microsoft's approach has never been about focusing on individual features, but on getting the basics better than anyone else. 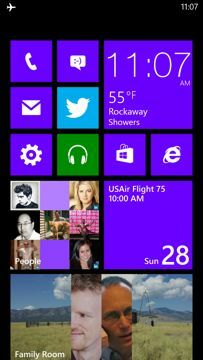 We can see that in the Hubs Microsoft has created for Windows Phone 8. The People Hub, for example, is the central point on which everything else to do with the platform hinges. The People Hub lets you manage your various social networks and contacts in one place that is visually appealing and robust when it comes to avenues for communicating. By adding the Rooms functionality, for example, WP8 users have an incredibly powerful tool to interact in a more intimate way with their closest social circles. Kids Corner is another excellent idea that's well implemented, and frankly is a feature that's long overdue for all smartphones. It sets up a nook in the operating system that lets kids access parent-controlled features without risking the security of the entire device. Well done, Microsoft. I can't say that WP8 is as straight-forward to use as iOS, or as wildly customizable as Android, but it offers a refined experience that still includes plenty of flexibility for making each device personal. The overall experience is slick and modern, and once you learn the ins and outs of the platform, it is simple to control. Combine the many new and improved features with the forthcoming wider array of appealing handsets, and Windows Phone 8 is primed to bring Microsoft back into the smartphone game from the fringes, as a real contender.